Barbro is the first prince of the Re-Estize Kingdom, son of King Lanposa III, and older brother of Renner and Zanac. He has a large build and befitting of a member of the royal family, he is described as of respectable stature and deeds. He has a bossy and short-tempered personality. He is competing on the line of succession against Zanac, the second prince, and Marquis Pespea, the son-in-law of King Lanposa III. Barbro's position was weakening due to the demon incident of Re-Estize. His father sent him to Carne Village to gather information. 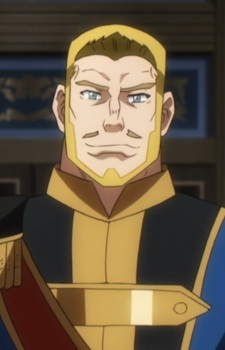 He told the villagers of Carne Village that Ainz Ooal Gown is the Kingdom's enemy which lead many of the villagers to rebel against him and side with their savior. Seeing this treachery, he ordered his army to attack and destroy the village. However, his army was repelled by Enri's newly summoned goblin army. He ordered his army to retreat, but he was captured and tortured for half an hour by Lupusregina Beta, eventually killing him.